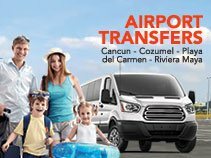 Now we offer you transfers from the Cozumel airport as well. These pre-reserved airport shuttles make your trip to Cozumel painless and stress-free. You know what you're getting in advance - air-conditioned comfort and a driver who will be there waiting for you. This option is cheapest for 1 or 2 people. See also Private Transfers. Arriving into the Cancun airport and trying to get to Cozumel? See our Cancun Airport Transfers. THE BEST RATES IN COZUMEL! Includes: Transfer to ferry pier in Playa del Carmen, Ferry Tickets to Cozumel (a $13.00 per person each way value), Transfer from Cozumel Ferry Pier to your Cozumel Hotel. Round-trip Transfers add the reverse. Fully escorted transfers from the Cancun Airport to your Cozumel Hotel and back. Q: I'm staying at a private home, condo, or villa. Can I use your service? A: Yes, we provide transportation to all private homes, condominiums, villas, hotels, vacation rentals, and even the Cozumel Ferry pier. A: You will see our representative holding a sign with the company logo. We will provide you with a toll-free telephone number to call if there are any issues at all. We will track your flight, and make sure that we're there to get you as agreed, even if you are delayed. That's part of the service we provide. Q: I'm arriving at the Cancun Airport - can you pick me up there? Q: I'm taking the Cozumel ferry. Do you offer shuttles to/from the pier? A: Yes. You can use our service for transportation both from the Cozumel ferry pier to your Cozumel hotel, and from your hotel to the ferry pier. You can book this service by clicking "Book Now" above. Just write your ferry arrival and departure information instead of the airline information. No extra cost. Q: Do you have child car seats? A: We do not have car seats available, so if you need a car seat you will need to bring your own. Kids in a car seat pay per person price because they are using a seat. Kids under 1 year old sitting on a parents lap and then they are free. Use the navigation bar at left to browse our massive selection of Cozumel Tours & Excursions.